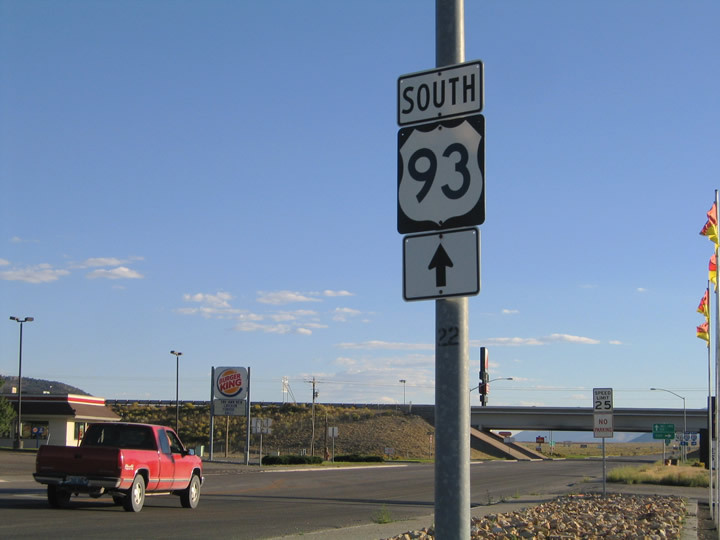 This U.S. 93 south shield is posted between Sixth Street (Business Loop I-80, which is former U.S. 40) and Interstate 80 (Exit 352) on the Great Basin Highway southbound in Wells. Business Loop I-80 east joins U.S. 93 southbound briefly before returning to the freeway ahead. Photo taken 09/08/05. 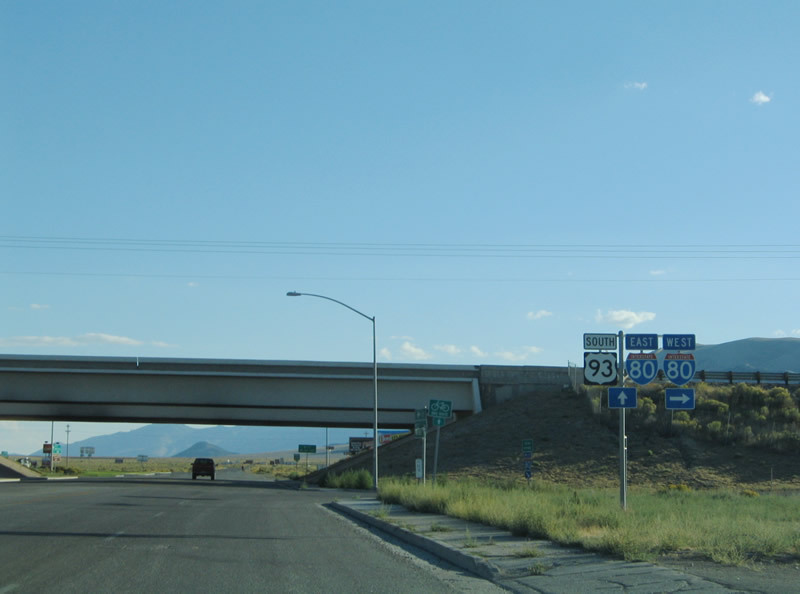 U.S. 93 (Great Basin Highway) southbound at the westbound on-ramp to Interstate 80 and Elko. The eastbound ramp departs from the left ahead for Wendover and Salt Lake City. U.S. 93 continues south of Business Loop Interstate 80 78 miles to Lages Station and the south end of U.S. 93 Alternate. U.S. 93 Alternate south (unsigned here) follows Interstate 80 east to West Wendover. Photo taken 09/08/05. The city limits for the village of Ely. Home to 4,041 people as of the 2000 Census, Ely is the seat of White Pine County and sits at an elevation of 6,435 feet above sea level. Ely sits at the intersection of U.S. 6, U.S. 50, and U.S. 93. 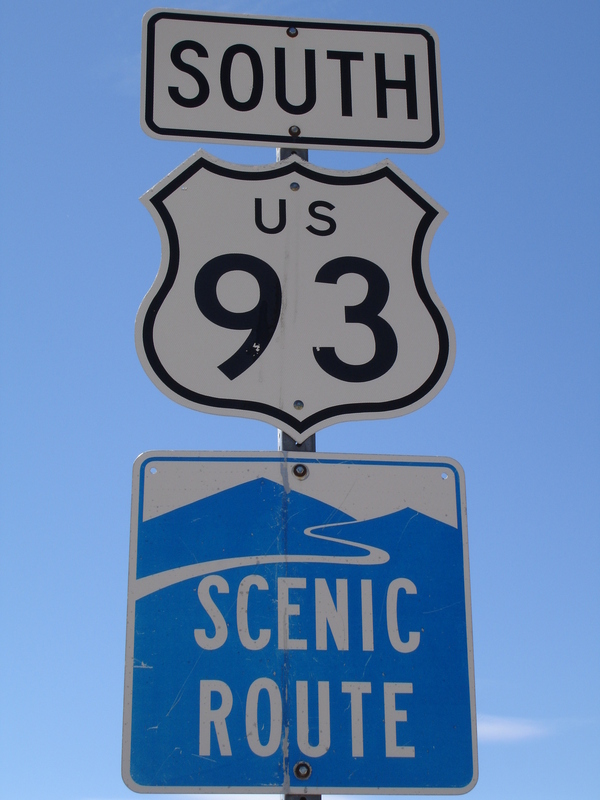 The Lincoln Highway also passes through town, following U.S. 93 from the north and then connecting to U.S. 50 west toward Eureka, Austin, Fallon, and Carson City. The local economy depends on nearby mines and tourism. With its location near the eastern end of the "Loneliest Road in America" (U.S. 50 from Fallon east to Utah), Ely is a major stop for motorist services along east-west travelers along U.S. 6-50 and for north-south travelers along U.S. 93/Great Basin Highway. 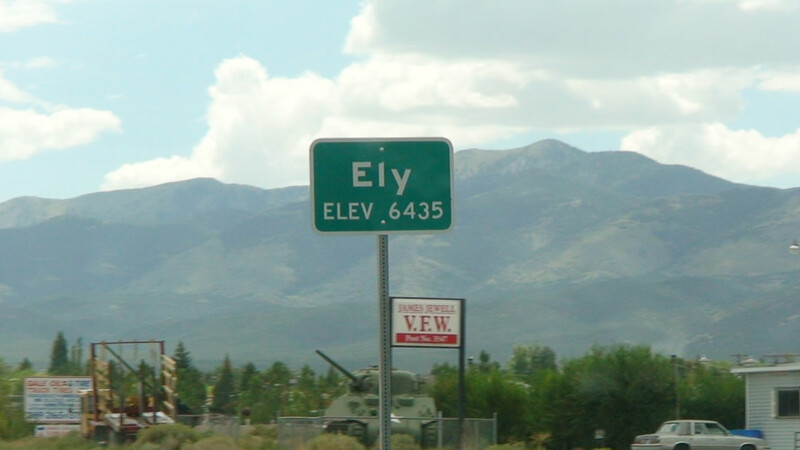 The Ely city limit sign provides the elevation but not the population or date of incorporation. This is typical for most Nevada city, town, or community limits signs. Photo taken by Jose Gutierrez (08/15/07). After leaving U.S. 6-50 at Majors Junction (which is located west of Baker and Great Basin National Park yet southeast of Ely) is this cutout reassurance shield for U.S. 93/Great Basin Highway south. Photo taken 06/20/10 by Mark Galbreath. Southbound U.S. 93 approaches Nevada 166 near the Lake Mead National Recreation Area Visitor Center. 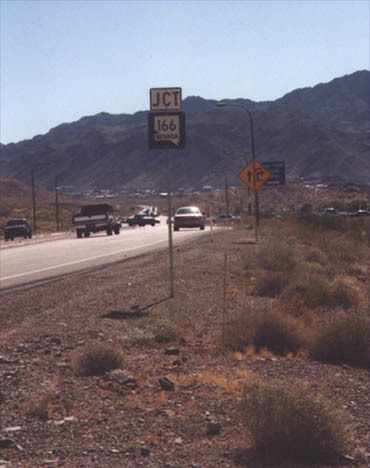 Nevada 166 signage was removed at some point between 1997 and 2000, because Nevada 166 is no longer maintained by the Nevada Department of Transportation. Photo taken 6/97. 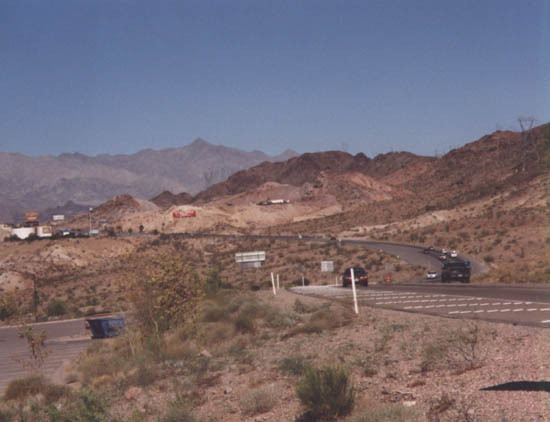 Continuing southeast on U.S. 93 after the former Nevada 166 junction, this view is afforded from the visitor information center located at the northeast corner of the intersection. Photo taken 6/97. Page Updated September 2, 2011.